Director/Photography – Mark Atkins, Screenplay – Mark Atkins & Kiochi Pesetsky, Producer – David Michael Latt, Music – Christopher Cano & Chris Ridenhour, Visual Effects Supervisor – Glenn Campbell, Production Design – Ry Wahl. Production Company – The Asylum. On Isla Corazon off the coast of Mexico, William runs a life-coaching course that teaches couples to reconnect through various physical challenges. As William puts the current batch of people through the course, his wife and business partner Suzanne announces that she wants a divorce. At the same time, the group on the island are attacked by a six-headed shark. As they realise, it is the product of classified US government experiments that were being conducted in a floating laboratory just off shore, which have created a shark with the ability to regenerate its heads. The Asylum have had great success with their killer shark films, in particular the bad phenomenon of Sharknado (2013) and sequels. They started everything off with Mega Shark vs Giant Octopus (2009), which has spawned three sequels and elsewhere they have unleashed the likes of Shark Week (2012), Ice Sharks (2016), Planet of the Sharks (2016) and Empire of the Sharks (2017). 2-Headed Shark Attack (2012) was another of The Asylum’s absurdly titled killer shark films. This proved a success and so they spawned 3-Headed Shark Attack (2015), 5-Headed Shark Attack (2017) and now 6-Headed Shark Attack. However, the Multi-Headed Shark Attack series (as it is colloquially known) never quite hits the same heights of deliriously tongue-in-cheek absurdity that the Sharknado films do. The only real gimmick the Multi-Headed Shark Attack series has is to keeping on adding heads to the shark. And after 5-Headed Shark Attack where the shark’s tail was a head, there doesn’t seem much further the series can keep going – all that 6-Headed Shark Attack seems to offer is an almost identical monster (although this time it has developed the ability to keep regenerating its heads after they are cut off). I must admit though that part of me does have an undeniable curiosity to see what would happen if the Multi-Headed Shark Attack series developed more than ten heads. Mark Atkins, a regular Asylum director (see below), does a serviceable job. At least, he gets the idea of the Asylum-patented gonzo shark film down better than newcomer Nico De Leon did in the previous film. There are the entertainingly absurd set-pieces expected of the film. The film’s one moment of delirious Sharknado-like silliness is where the six-headed shark emerges up onto the beach, walking on two of its heads. To expectation, the effects fall between the semi-competent and amateurishly slipshod – notably the shark maelstrom. There are certainly times the film looks cheap – the government research laboratory, for instance, is no more than a tarpaulin covered platform anchored at sea. 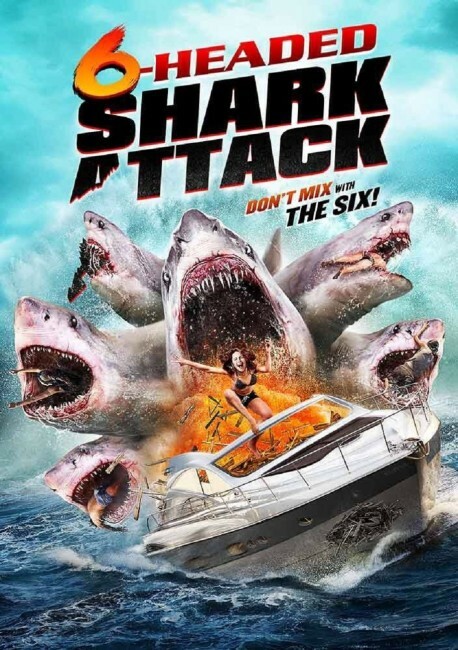 In all other regards, 6-Headed Shark Attack plays out as a regular B killer shark film. The Asylum have gone on location in South Africa and cast a bunch of local actors who are pretending to be standard Americans. It may say something about how impoverished the South African film industry is these days – or maybe just that The Asylum couldn’t afford any better – but it has to be said that some of the actors are not very good. In particular, lead actor Brandon Auret feels like he has stumbled into work after a week-long drinking binge – and without even taking the time to shave and shower first.